I started the day out at Glenn’s, an “old fashioned bakery” on historic Route 66 before heading to Navajo Nation. It was definitely a popular, morning destination among the locals and passersby. Cars surrounded the building and lined up in the drive through. I was expecting to find muffins and other pastries. While there were some, donuts filled most the counter space. I stood there perplexed; it had to be something. I asked again, and she replied the same. This time I was speechless. Perfect, I ordered the flaky dough pastry sprinkled with cinnamon sugar and a coffee to go. The beginning of our next scenic drive started in Chinle, Arizona. Chinle is located in northeastern Arizona on a Navajo Indian Reservation and is the closest town to Canyon de Chelly and Canyon del Muerto where we spent the entire day. Canyon de Chelly (pronounced DuhShay) is part of the United State National Park System. The South Rim Drive, a 34 mile round-trip through Navajo Nation, provided panoramic views of the canyons, the Defiance Plateau, and the Chuska Mountains. Our stops along the way included Tunnel Overlook, Tsegi Overlook, Junction Overlook, White House Ruins, Sliding House Overlook, Face Rock Overlook, and Spider Rock Overlook. 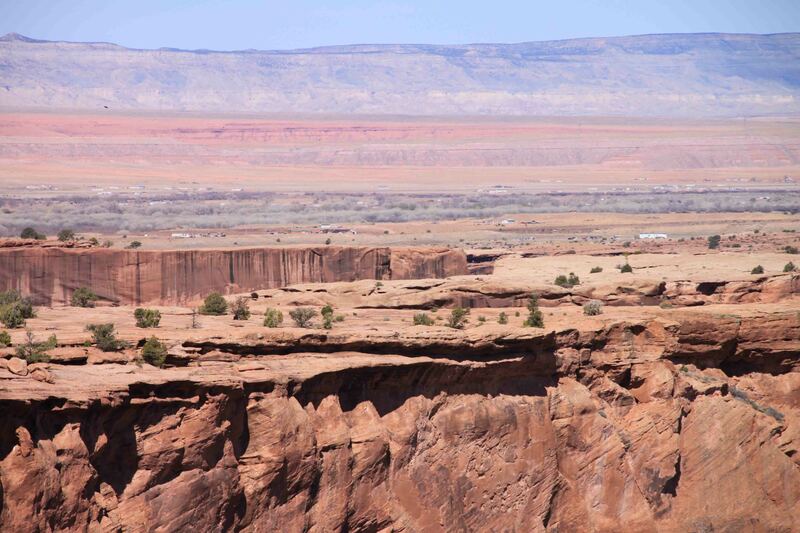 Navajo’s waited at each overlook showcasing their handmade jewelry, painted rocks, weaved rugs, and pottery. They were all so soft spoken and kind. If I browsed over the jewelry delicately placed on a blanket covering the hood or trunk of their car, they politely greeted me with, “You are welcome to pick anything up”, and then they quickly quoted their price. If I just felt like passing by to enjoy the scenery, they respected my choice and didn’t push a sale which made it quite enjoyable to speak with them. They were all from around the area, either living down in the valley, near the rim, or in Chinle. I purchased some earrings from Bessie Henry. Her husband is well known for the storyteller bracelet of the canyon. The 2006 Arizona Highways magazine featured his work. Her grandfather, a medicine doctor who raised her, was also featured in the magazine several years ago. The article discussed Spider Rock. I also picked up a painted rock (probably not the correct terminology), but the painting depicted a medicine man. Sam, the young man who painted it, chronicled the meaning of the symbols: the hands were healing hands and the feathers represented the number of ceremonies the doctor had held for his “patients”. The highlights of the stops on the South Rim in Navajo Nation were the White House Ruin and Spider Rock. The White House Ruin was built by ancestral Puebloan people and occupied over 1,000 years ago. It is named for the long wall in the upper dwelling that is covered with white plaster. It could be reached via a 2.5 mile round-trip trail to the canyon floor 500 feet below. The White House Trail is the only trail where visitors may enter the canyon without a Navajo Guide. Naturally, I hiked down the narrow, rock path along the edge of the canyon wall and crossed the creek to view the ruin. Unfortunately, Petey wasn’t allowed to join me, so I gave him a chewy and let him enjoy the cool breeze in VANilla. Spider Rock is an 800-foot sandstone spire that rises from the canyon floor at the junction of Canyon de Chelly and Monument Canyon. It was the last stop on the South Rim. After visiting all the sites on the South Rim Drive, we took the North Rim Drive through Navajo Nation which led us along the edge of Canyon Del Muerto. The highlights included the Antelope House Overlook, Mummy Cave Overlook, and Massacre Cave Overlook. The Antelope House is named for the Navajo paintings of running antelope on the cliff wall nearby the ruins; though, the Anasazi Indians were the ones who constructed and lived in the dwellings. The structures at this site are believed to be built around 1050 AD. The Navajo paintings are believed to be the work of Dibe Yazhi who lived in the area around the 1830s. The paintings share the wall with Anasazi pictographs. Members of an archaeological expedition in the 1880s named the Mummy Cave after finding two well preserved mummies at this location. The Navajo name for the location is Tseyaa Kini, meaning House Under the Rock. The dwelling is the longest occupied Anasazi site in the canyon. The large rooms and masonry of the central tower contrasts with the smaller style rooms in the dwellings on either side, suggesting that people from the Mesa Verde area moved into the canyon around 1280 AD. Massacre Cave refers to the Navajo killed here in 805 by a Spanish military expedition led by Antonio Narbona. Narbona’s men discovered approximately 150 Navajo taking shelter on the ledge above the canyon floor and open fired on the Navajo’s from the above rim. Hey, Beth, I am an ole Kappa Sig pal of your dad. I was informed of your blog by Lucijane Belding, who I know way back from our U.T. days. A buddy of mine who teaches at St. Marks and I made a tour of N.M., Ariz, and Utah Indian sites several years back. Nothing in the world I have ever seen has touched me as much as Canyon de Chelley. We split a six pack, maybe two, staring down at Spider Rock when we first arrived. Then the next day took the jeep tour in the canyon. I think even Charlie would have been impressed. Thanks for the note…Yes, I was pleasantly surprised by the canyon. I can’t believe their isn’t a user fee. It wasn’t that crowded either!